Hair Question: How Did You Thicken Your Hair? - Hairlicious Inc. Awesome, thanks so much, my hair is grazing bsl but it's not as thick as I want it. I started coating my hair with roux protestor porosity control during my last relaxer and I stretch 12-16 weeks. I will def be incorporating your suggestions because your hair is the cats meow. Be blessed !! I'm glad my post was helpful! Thank you for reading! Great tips! Your hair is very lovely. I admire the thickness from root to tip. I'm not there yet. One day! Do you consider yourself texlaxed or relaxed? Thank you DivaChyk! I appreciate the compliment. I consider myself relaxed, just not bone straight. There's a bit of texture left over in my hair, but not enough to be considered texlaxed. Idk where the word "protestor" came from lol. Please excuse my error. thank you for your tips, and for this fantastic blog. I have learnt so much from it. I have a question - do you dilute your relaxer i.e. mix it with olive oil or something else? I read that tip in another website and I tried it the last time I did my hair. (A Virgin Relaxing, because I had cut off all my hair at the start of the year). I'm not very happy with the results. My hair "softened". A comb can run through it now, in a way that was Herculean before. But my hair doesn't "look" relaxed, in the least and roller sets don't stay in my hair. Now I don't know what to do in my next touch-up. (I'm aiming for 10weeks stretch.) Should I relax my whole hair again - roots and old growth? Please advice! Thank you so much for taking the time to read my blog. I appreciate it. I'm happy to hear that it was useful to you. As far as my relaxer goes, I do not dilute it with any oils or conditioners. It is a trick many women use to make the relaxer work slower therefore decreasing it's strength. With this method, you'll end up with texlaxed hair. There will be a lot of texture left over in the hair. Your hair will be much stronger. What type of results are you looking for? Do you want a straight look or something with a little more texture? 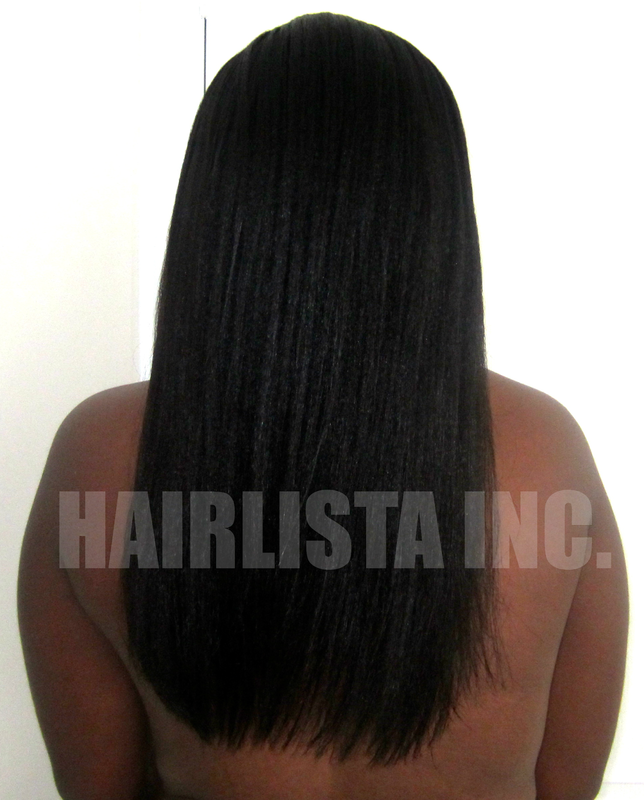 If you want your hair straighter, you would have to apply the relaxer from root to tip. Buy a normal strength relaxer, but don't leave it on for too long i.e. 15-20mins is good. This would be called a "corrective relaxer". The following relaxer, you would then just apply it to your roots. I hope this helps. Let me know if you require more assistance. Hi Sunshyne! So i have a bottle of the Aphogee 2 minute, and plan to use during my next wash. I also have the Mazani moisturfuse conditioned. Is it a good idea to use the Mazani after the Aphogee as a deepconditioner? And then Finish with Aubrey honeysuckle conditioner, since it contains no protein? Also i have a bottle of CHI Silk Infusion, but not sure how to use it! Any suggestions? Okay, the Aphogee 2 min. reconstructor is a light protein reconstructor that is used to strengthen and fortify the hair. This can be used once a week. It's best to follow up with a moisturizing conditioner after to soften and moisturize the hair. Protein tends to make the hair hard so it's best to follow up with a moisturizing conditioner with heat. You could either use Mizani Moisturefuse or Aubery Organics Honeysuckle rose conditioner. Both are moisturizing deep conditioners that will soften and penetrate the hair. There's no need to use both unless you want to mix them - which is completely fine..
CHI silk infusion can be used after you apply your leave-ins in your hair. It's a nice serum to seal in the moisture in your damp hair. It's also a heat protectant, so you can use it before you flat iron or blow dry your hair. Such a great post,my hair has gotten incredibly thicker due to a combination of these tips. Thanks girl!! Thick hair is a wonderful thing! It's what I aim for :) Thanks for reading!! Just a point of clarification when you say prepoo before shampoo do you mean before you relax? Hi Sunshyne, I'm wondering if I should use ORS replenishing conditioner as a protein treatment only. I know it's M/P Balance. I'm 12 wks post. I used it, it's was great, my hair was soft and nice. Depending on your hair type, it may be sufficient enough for you or you may need something stronger down the road. It's a great deep conditioner to use in between reconstructors and hard protein treatments. Pay close attention to your hair and how it responds (moisturized, strong hair vs. dryness, breakage and shedding). That's the best way to find out whether or not you should keep it in your regimen. On Friday i went ahead and use the Aphooge 2 min....rince then applied the Mazini moisfuse, which has wheat protein and ended up with hard stiff hair.:-). Good thing u found you post about protein overload and went into imidiate damage control. Good thing i had a bottle of Vo5 kiwi clarifying shampoo along with the Aubery honey suckle. I am home today, so i got up this morning clarify, wash with Aubery honey suckle poo, then deep conditioning with Aubery, Gvp Matrix biolage balm, since they are both protein free. Also added some grapeseed, jbco, evoo oil, and honey. I am sitting under my hooded dryer as i type. I hoping i'll be able to reverse some of the damage done. At least i learn something from my mistake. Trial and error:-). I also learn finding protein free products is in itself a challenge. Yes, it's all about Trial and Error, that's how I learned. In fact, it's the best way to learn! You'll come out of the situation much more knowledgable. Protein overload takes a few weeks to repair. You should follow up with several moisturizing deep conditions to restore the proper balance. Don't worry, you'll be fine :) You are definitely on the right track!! Hi, you say you do the relaxer for 20 - 25 minutes. On my ORS jar, normal, not super, it says 10 - 11 minutes. If I do that it gets more or less bone straight. What is the reason for you to put it in longer? Also, do you wear your hair out when it is newly relaxed? Hmmm...on my relaxer bucket, it says 20 mins. I usually go an extra five minutes because my hair doesn't "take" really well and I usually relax at 12 weeks and that's when I have a ton of new growth. It's hard to work through sometimes. Will you continue to incorporate the Aphogee 2 minute reconstructor in your winter regiman? I love your blog especially since its hard to find current blogs with relaxed women. I don't remember the last time I got a pern want to say about May not sure. Do I was going to wait till the new year about the events of December to get a perm I will def be sealing my end before perm goid suggestions. So when I perm my hair would you suggest that I wear it out and not put it back in braided protective style. And one more question. Can you use to much oil on your hair. I have in crochet braids and I condition, moisturize my hair with qp mango butter stuff then I seal it in with my oil mix every night if that to much. I shower with my hair out so it can get some steam before I do those things. Please help us that to much. Awww thank you Bossychik! Yes, relaxed ladies are becoming far and few. When you relax you hair, you can definitely wear it out/down for a couple weeks. Enjoy your hair. It's important to enjoy it. However, be mindful of the amount of times you use direct heat when keeping your hair down. Using oil while wearing Crochet braids can be a little much especially since you are moisturizing with Elasta QP Mango Butter, which is quite heavy. For those who wear braids, I always suggest using a spray bottle to moisturize down the length of the braid. You can make your own moisturizer i.e. little bit of water, EQP Mango Butter, aloe vera juice etc. Aloe vera juice is great for the hair/scalp. I have strongly suffered from seasonal hair loss. Did not want to go to the doctors, tried different shampoos, conditioners, misc hair nutrition products – with almost no results whatsoever. Then, I’ve read on the hair support forum that there could be a lot of internal reasons for hair loss, and the basic nutrition has to be done from inside out. I started to take vitamins and supplements. Recently, I’ve read about Hair Gain Formula by Military Grade and tried also this supplement product. I’ve been taking it from September and fortunate for me I no longer have seasonal hair loss. I am happy I don’t have to take dozens of pills - all necessary vitamins are contained in this supplement. And it really works! Will definitely take it until spring at least, to check the second ‘dangerous’ season. Hello I am new here and I am overwhelmed with all the information but I welcome it. As of maybe a few weeks ago my hair started shedding real bad. I am 11 months postpartum and breastfeeding so it could be a lack of biotin (which is not in my prenatals) and also general damage from relaxers over processing etc. my hair is coming out in large amounts now and all over the bathroom floor and my clothes everyday so instead of going into depressive mode I am taking action. Tomorrow I would like to buy a few products. Any suggestions as I am starting off? I am also going to stretch my relaxer as long as possible. My hair was shoulder length but due to breakage is now neck length and breaking fast. Question: Do you guys oil your scalp? If so what are using? Because I currently dont and I am considering to start oiling my scalp with either my leave-in (suggestion of a hairdresser) or using JBCO. I am scared though because I heard that oiling the scalp blocks the hair follicules and then eventually the hair follicule stops growing hair at all. Has you been oiling your scalp for a long time? Credit to Sunshyne too for talking about protecting already relaxed hair when doing the roots - so helpful.